As promised in my previous blog posting, here are some photos from the 2006 Ride for Heart in Toronto. 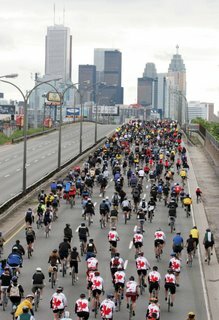 The first four photos are from various media sources, and the rest are from me. 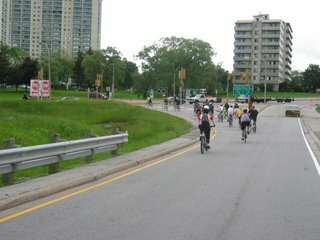 Here I am approaching the 50 km turnaround at York Mills Rd. 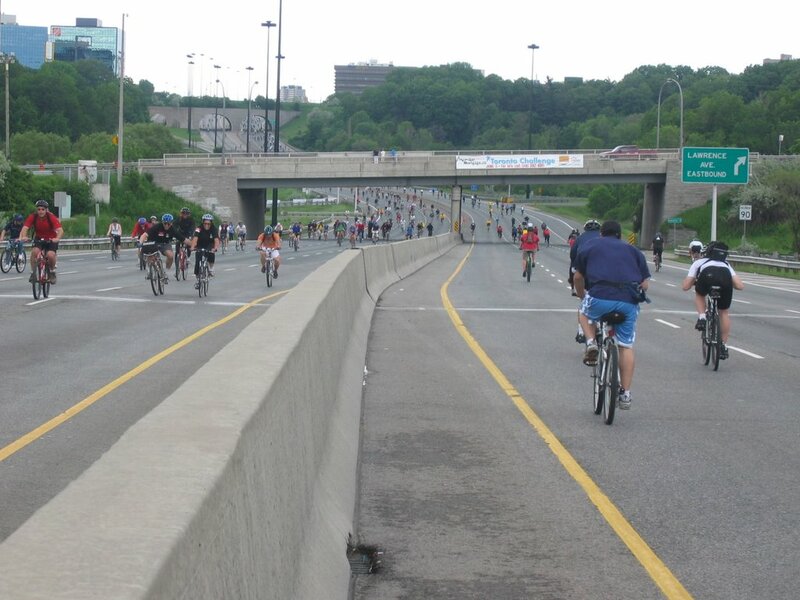 When I was doing the stretch between Don Mills and Eglinton (the hardest stretch of the bike ride in my opinion), I had seriously considered packing it in and just riding home once I reached York Mills Rd. 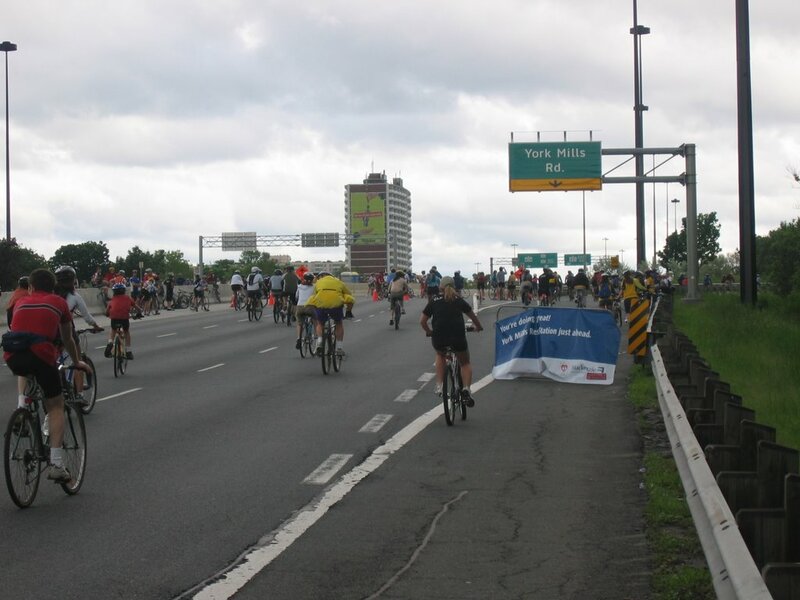 However, once I arrived here, I actually felt like completing the course was possible. Approximate time into the ride - 1h 10m. I've seen this view all too many a times, but from the inside of a car (this is about a couple kilometres from where I live). 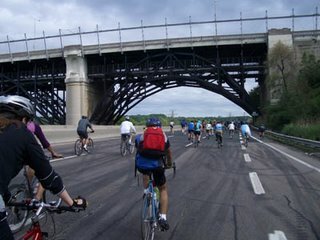 A quick left and it is time to head back to the CNE grounds (25 km away). 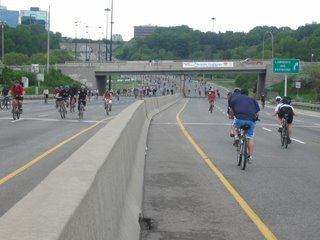 Heading southbound on the DVP approaching Lawrence Avenue East. There are still a lot of people behind me; however, they are almost done the hard half of the ride. 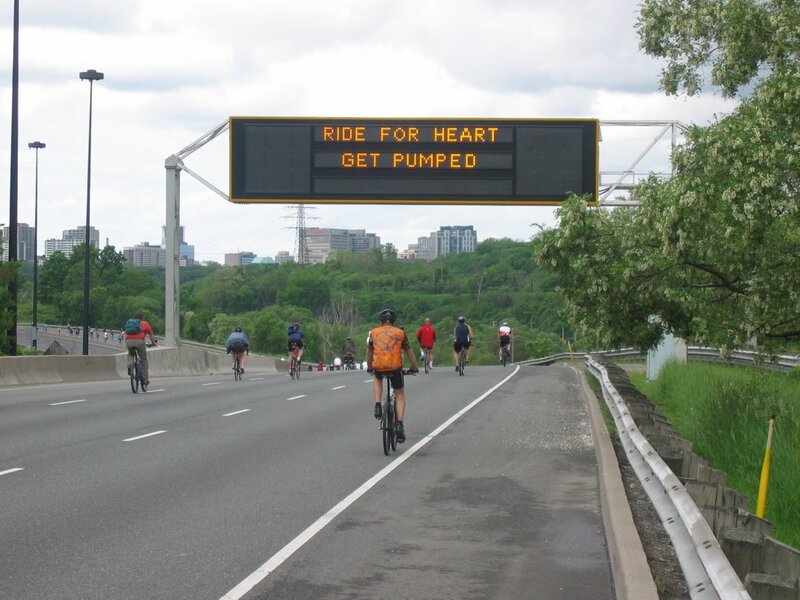 Even the overhead electronic signs on the DVP have been altered (by the City's Traffic Management Centre) to encourage the bike riders along. 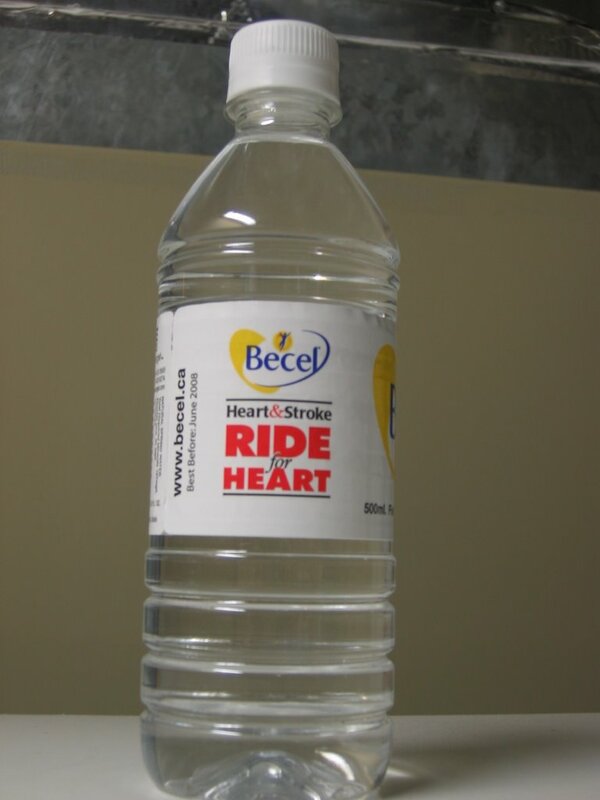 Water was passed around to the bikers at the rest stations. While water was great, people really should not have discarded the bottles on the road (as mentioned in my previous blog posting). 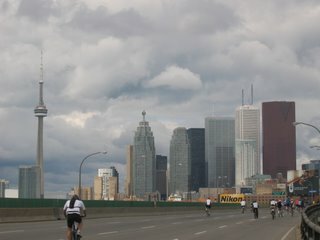 A unique photo opportunity of the Toronto skyline from the east. 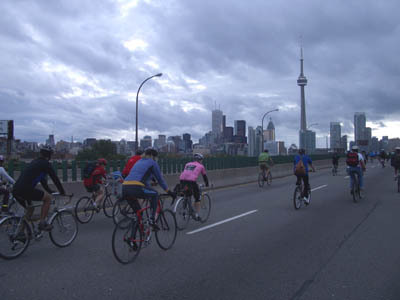 The CN Tower, First Canadian Place, Scotia Plaza, Canada Trust Tower, TD Tower, Rogers Centre (nee Skydome) and more can be seen from this unique vantage point. 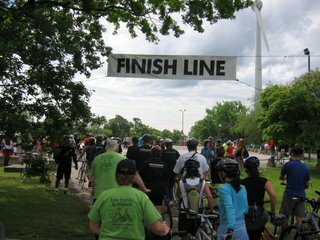 The finish line! 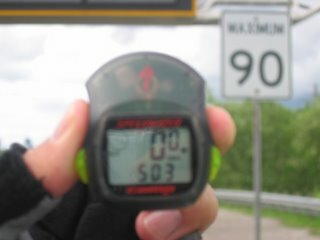 1 hour and 57 minutes after starting. 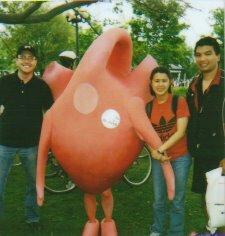 I think they could have made this finish line a little nicer..
Neil, Crystal and I in the pre-requisite group shot with the Heart and Stroke Foundation's 'Heart' mascot (I don't know... sort of looks like a headless chicken to me). All in all, it was a great day on many accounts. 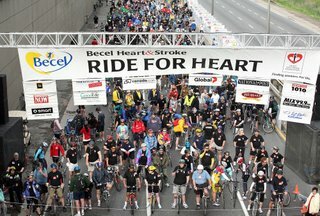 I am looking forward to doing it again next year if I am in Toronto. 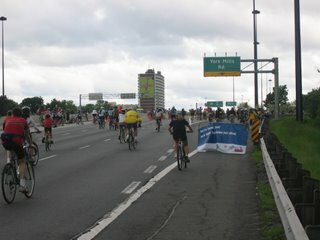 My goal would be to complete the 50 km course in 1h 45m (12m faster than this year).